Abstract Art Online – Art Prints at Wholesale Prices! For abstract art online that was create after WWII, browse this selection of Abstract Expressionism and Tachisme abstract art. 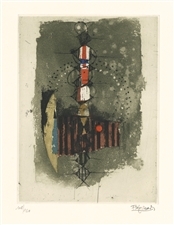 The prints and pieces for sale in this gallery include an authentic selection by Joan Miro and bold colorful pochoirs, woodcuts, etchings and more by abstract artists like Sam Francis, Joan Mitchell, Antoni Tapies, Jean-Paul Riopelle, Alexander Calder, Pierre Soulages, Henry Moore, Ernst Wilhelm Nay, Jean Fautrier and many others. In Affordable Art 101’s abstract gallery online, we feature artists representing the Italian Futurist & Concrete Art movements. With gorgeous color and lines defining most pieces, the abstract art online in this style includes works by Lucio Fontana, Joe Cesare Colombo, Enrico Bordoni, Carolrama, Atanasio Soldati and more. Get art prints at wholesale prices from these renowned artists! 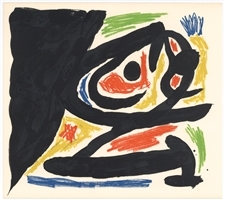 An avant-garde abstract art movement taking place in the 1950s, CoBrA was formed by four artists from the home cities of Co(penhagen), Br(ussels) and A(msterdam). The artists in this gallery include Pierre Alechinsky, Asger Jorn, Karel Appel and more! 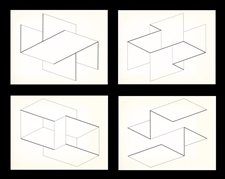 Our abstract art online covers Minimalist, Hard Edge and Op Art styles including works by De Stijl artists Theo van Doesburg, Piet Mondrian; as well as Ellsworth Kelly, Jean Arp, Auguste Herbin, Yaacov Agam, Victor Vasarely and other important figures of these movements. Medium: original silkscreen. Printed from nine separate screens by Simca Print Artists of New York on Patapar parchment paper in an edition of 3000, and published by Brooke Alexander. The catalogue reference number is Field 14. 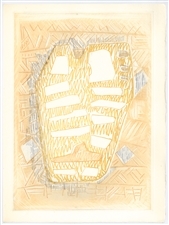 Jasper Johns executed this piece especially for the paper dustjacket cover of the Field catalogue raisonné, issued in 1977. Size: 9 5/8 x 10 1/8 inches (250 x 260 mm). Not signed. Although 3000 were printed in 1977, it is not known how many survive today. The special parchment paper chosen by the artist was very attractive but not particularly suited to endure the test of time, as it often darkens and becomes brittle with age. This impression is in the best condition I have ever seen of this work, with full margins and only minimal toning. The catalogue itself is also included to demonstrate provenance. A lucky find! Piet Mondrian serigraph "Composition en bleu b"
Medium: serigraph (after the 1917 painting). This exquisite Mondrian (also spelled Mondriaan) was printed in a limited edition of 300 in 1957 at the atelier Arcay and issued by Galerie Denise René. Printed on Bristol San Francisco smooth wove paper, the image size is 15 1/2 x 13 3/4 inches (395 x 350 mm) and the full sheet measures 26 x 20 inches. Not signed. A very nice impression! Condition: there is minor wear to the edges of the sheet, not affecting the image. 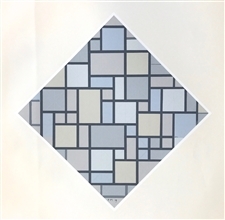 Piet Mondrian serigraph "Composition No. 3"
Medium: serigraph (after the 1917 painting). This exquisite Mondrian (also spelled Mondriaan) was printed in a limited edition of 300 in 1957 at the atelier Arcay and issued by Galerie Denise René. Printed on Bristol San Francisco smooth wove paper, the image size is 14 x 17 inches (353 x 435 mm) and the full sheet measures 20 x 26 inches. Not signed. A very nice impression! Piet Mondrian serigraph "Composition rouge, jaune, bleu"
Medium: serigraph (after the 1926 painting). This exquisite Mondrian (also spelled Mondriaan) was printed in a limited edition of 300 in 1957 at the atelier Arcay and issued by Galerie Denise René. Printed on Bristol San Francisco smooth wove paper, the image size is 15 1/2 x 15 1/2 inches (395 x 395 mm) and the full sheet measures 26 x 20 inches. Not signed. A very nice impression! Condition: there is minor soiling in the margins and wear to the edges of the sheet, not affecting the image. 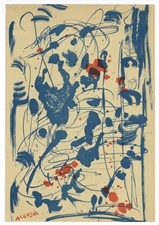 Medium: serigraph (after the 1942 painting). This exquisite Mondrian (also spelled Mondriaan) was printed in a limited edition of 300 in 1957 at the atelier Arcay and issued by Galerie Denise René. Printed on Bristol San Francisco smooth wove paper, the image size is 20 x 10 inches (505 x 251 mm) and the full sheet measures 26 x 20 inches. Not signed. A very nice impression! Piet Mondrian serigraph "Broadway Boogie-Woogie"
Medium: serigraph (after the 1942 painting). This exquisite Mondrian (also spelled Mondriaan) was printed in a limited edition of 300 in 1957 at the atelier Arcay and issued by Galerie Denise René. Printed on Bristol San Francisco smooth wove paper, the image size is 13 3/4 x 13 3/4 inches (350 x 350 mm) and the full sheet measures 20 x 26 inches. Not signed. A very nice impression! Condition: there is some creasing and discoloration in the margin, not affecting the image. Piet Mondrian serigraph "Composition bleu, jaune"
Medium: serigraph (after the 1936 painting). This exquisite Mondrian (also spelled Mondriaan) was printed in a limited edition of 300 in 1957 at the atelier Arcay and issued by Galerie Denise René. Printed on Bristol San Francisco smooth wove paper, the image size is 15 1/4 x 15 inches (387 x 380 mm) and the full sheet measures 26 x 20 inches. Not signed. A very nice impression! Condition: there is some creasing and soiling in the margin, not affecting the image. Piet Mondrian serigraph "Composition avec couleurs claires et lignes gris"
Medium: serigraph (after the 1919 painting). This exquisite Mondrian (also spelled Mondriaan) was printed in a limited edition of 300 in 1957 at the atelier Arcay and issued by Galerie Denise René. Printed on Bristol San Francisco smooth wove paper, the image size is 16 3/8 x 16 1/4 inches (417 x 414 mm) and the full sheet measures 26 x 20 inches. Signed in the plate, not by hand. A very nice impression! Condition: there is minor soiling and foxing in the margins; and a vertical crease. Woman and Birds in the Night Medium: original pochoir stencil print in four colors. Catalogue reference: Dupin 50. Published in 1947 in an edition of 1500 by Curt Valentin for the very rare album "The Prints of Joan Miro". The English title of this piece is "Woman and Birds in the Night". The publisher's inscription is printed on verso, which authenticates the print. Sheet size: 11 x 8 1/4 inches (278 x 210 mm). Not signed (this is the only edition and none were signed). A very nice impression in fresh color on cream wove paper. Condition: there is minor creasing (mostly near the edges of the sheet). Medium: original color woodcut. Catalogue reference Roethel 106. Published in Paris in 1938 for XXe Siecle (No. 3). Image size: 4 7/8 x 7 1/2 inches (125 x 190 mm). Sheet size: 12 1/2 x 9 1/4 inches (317 x 234 mm). A good impression that brings out the subtle colors of this composition. Not signed. Medium: original woodcut. Catalogue reference Roethel 105. Published in Paris in 1938 for the rare XXe Siecle (issue No. 3). Image size 8 1/2 x 8 3/4 inches (217 x 220mm), with full original margins; the sheet size is 12 1/2 x 9 1/2 inches (318 x 244 mm). Signed in the block (not by hand). Condition: there are six pinholes along the left edge of the sheet -- this is from the publisher's original binding staples, and also serves to demonstrate the provenance of this work. Medium: original silkscreen / serigraph. 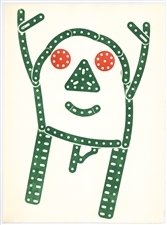 This silkscreen was printed in 1966 and issued in an edition of 2200 by the Stedelijk Museum of Amsterdam. 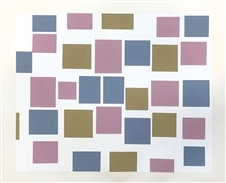 This was the second screenprint executed by Ellsworth Kelly, and he created it especially for the "Vormen van der Kleur" (New Shapes of Color) exhibition catalogue, published in 1966 by the Stedelijk Museum and now quite scarce. The silkscreen measures 10 1/2 x 10 1/2 inches (270 x 270 mm). A beautiful impression in rich color. Not signed. Medium: original etching. This etching was executed in 1970 for Paroles Peintes IV, and is from the edition of 150 on Johannot wove paper. A limited number of signed proofs were also issued; this impression is not signed. Plate size 13 1/2 x 9 1/2 inches (344 x 243 mm). Published in Paris in 1970 for the Paroles Peintes IV portfolio, by Lazar-Vernet. 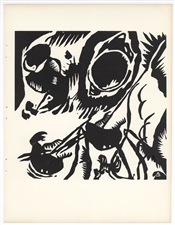 This was an art and poetry project featuring original prints in a small edition. There was no second edition of this Henry Moore and no later printing. A very rich impression, with burr! Medium: original lithograph. This is an original print contributed by Henry Moore in 1975 for the portfolio "San Lazzaro et ses amis", published in Paris. A number of important artists collaborated together on this project, in homage to Gualtieri di San Lazzaro, founder of the deluxe art revuel XXe Siecle (Chroniques du Jour), and an instrumental figure in the Paris art world, as a publisher, critic and friend to many of the 20th Century's great printmakers. Among the artists represented are Pablo Picasso, Georges Braque, Joan Miro, Marc Chagall, Zao Wou-ki, Graham Sutherland, Max Ernst, Rene Magritte, Alexander Calder, Hans Hartung, Lucio Fontana, Alberto Magnelli, Henry Moore, Serge Poliakoff and Max Bill. This is a fine impression on quality Arches wove paper with deckle edges, printed in London in 1975 by Curwen Studio, in a limited edition of 575. The total sheet measures 10 1/4 x 14 inches (260 x 355mm). Not signed. Medium: pochoir (after the oil). Issued in 1967 in an edition of 1200 for the rare exhibition catalogue "Oiseau solaire, oiseau lunaire, etincelles", published by the Pierre Matisse Gallery. Printed in Paris by Ateliers Daniel Jacomet. Size: 10 x 7 1/4 inches (255 x 185 mm). The sheet is die-cut in the shape of an artist's palette, complete with a cut-out thumb hole. An exquisite impression with the pigment richly applied -- just as paint would appear on an actual palette. Mounted by the publisher along the top edge onto a support sheet. Not signed. Medium: original color etching. Signed in pencil and numbered 108/150. Printed in Paris by Georges Leblanc in 1972 for inclusion as a special loose insert for the catalogue raisonné of Friedlaender etchings published by Propylaen Verlag. A rich impression beautifully printed on watermarked Arches wove paper, the plate size is 7 3/4 x 5 5/8 inches (197 x 148 mm) and the full sheet measures 13 1/4 x 9 3/8 inches (337 x 240 mm). Medium: original lithograph. Published in Milan by Groupe Espace for the very rare 1958 volume of Documenti d'Arte d'Oggi. Sheet size 12 1/2 x 8 5/8 inches (318 x 220 mm); with printed text on the back, as issued (the text is a poem in Italian by Renzo Modesti). Signed in the stone and also with the artist's name printed in text; not hand-signed. Note: each impression of this lithograph that I've seen over the years has major variations in appearance, making these prints to be almost unique works. Compare this impression to the other one in our inventory. Medium: original lithograph. Catalogue reference: Mourlot 352. Executed for Derriere le Miroir (No. 148) in 1964, and published in Paris by Maeght. This lithograph was published on the occasion of the inauguration of the Fondation Marguerite et Aime Maeght. Sheet size: 15 x 11 inches (377 x 277 mm). Not signed. Medium: serigraph / silkscreen. This magnificent print was published in Milan in 1954 by Groupe Espace for the very rare Documenti d'arte d'oggi. A beautiful, rich impression! Sheet size 12 1/2 x 8 1/2 inches (318 x 220 mm). In good condition, with some age-toning at the top of the sheet. Signed in the plate (not by hand). The Movimento arte concreta (Concrete Art Movement), also known as MAC, was founded in Milan in 1948 by a group of Italian artists with their own unique aesthetic; principal among them were Atanasio Soldati, Gillo Dorfles, Bruno Munari and Gianni Monnet. The print offered here is a product of this movement, which brought together a number of artists who contributed original lithographs or serigraphs to this 1954 project. Among the artists represented in this portfolio were: Enrico Baj, Enrico Bordoni, Joe Colombo, Nino Di Salvatore, Gillo Dorfles, Asger Jorn, Plinio Mesciulam, Gianni Monnet, Bruno Munari, Bruna Pecciarini, Mauro Reggiani, Atanasio Soldati and Luigi Veronesi. Vintage original prints by many of these artists are rarely encountered today. Medium: original serigraph / silkscreen. This magnificent print was published in Milan in 1954 by Groupe Espace for the very rare Documenti d'arte d'oggi. A beautiful, rich impression! Sheet size 12 1/2 x 8 1/2 inches (318 x 220 mm). In good condition, with some age-toning. Not signed. Henry Moore original lithograph "Thirteen Standing Figures"
Medium: original lithograph. Catalogue reference: Cramer 41. Executed in 1958 and printed in London by Curwin Prints. This lithograph is a beautiful impression on handmade wove paper bearing the official Henry Moore watermark. Image size: 12 x 10 inches (303 x 250 mm). With full original margins, the sheet measures 18 x 12 1/2 inches. Not signed. Condition: there is a small hole in the light green area near the center of the lithograph that penetrates through the paper; most likely a natural feature of the rather rough, fibrous paper chosen by the artist. Note: each impression of this lithograph that I've seen over the years has major variations in appearance, making these prints to be almost unique works. Medium: original lithograph. This magnificent print was published in Milan in 1954 by Groupe Espace for the very rare Documenti d'arte d'oggi. A beautiful, rich impression! Sheet size 12 1/2 x 8 1/2 inches (318 x 220 mm). In good condition. Signed in the plate, not by hand. The Movimento arte concreta (Concrete Art Movement), also known as MAC, was founded in Milan in 1948 by a group of Italian artists with their own unique aesthetic; principal among them were Atanasio Soldati, Gillo Dorfles, Bruno Munari and Gianni Monnet. The print offered here is a product of this movement, which brought together a number of artists who contributed original lithographs or serigraphs to this 1954 project. Among the artists represented in this portfolio were: Enrico Baj, Enrico Bordoni, Joe Colombo, Nino Di Salvatore, Gillo Dorfles, Asger Jorn, Plinio Mesciulam, Gianni Monnet, Bruno Munari, Bruna Pecciarini, Mauro Reggiani, Atanasio Soldati and Luigi Veronesi. Joe Colombo joined Enrico Baj in his Arte Nucleare movement. Vintage original prints by many of these artists are rarely encountered today. Jasper Johns was one of the New York artists invited to contribute original compositions in homage to poet Frank O'Hara (1926-1966) for the "In Memory of My Feelings" project in 1967. Size: 12 x 18 inches. There is a center fold, as issued. Medium: original lithograph. Catalogue references: Cramer 132, Maeght 682. A richly inked impression on cream wove paper printed by Mourlot in 1970. Intended for the wrap-around cover of the Heinz Berggruen catalogue entitled "Peintres-graveurs contemporains", this proof was never folded or trimmed to fit the book. The full sheet size is 9 3/8 x 10 1/2 inches (238 x 268 mm). Not signed. A lucky find in far superior condition than is normal with this lithograph. Medium: original etching. Executed in 1965 for the deluxe limited edition "Paroles Peintes II" portfolio, published in Paris by Lazar-Vernet. A rich impression, one of 150 printed on Johannot wove paper. The plate size is 11 3/4 x 7 inches (295 x 175 mm) and the full sheet measures 14 3/4 x 11 inches (375 x 285 mm). Not signed. Medium: original color etching with embossing. Executed in 1965 for the deluxe limited edition "Paroles Peintes II" portfolio, published in Paris by Lazar-Vernet. A magnificent, rich impression, one of 150 printed on Johannot wove paper. The full sheet measures 14 3/4 x 11 inches (375 x 285 mm). Not signed. Fernand Leger lithograph "Elements sur un fond bleu"
Medium: lithograph (after the painting). Printed in 1949 by Mourlot Freres and published by the Musee National d’Art Moderne in Paris for a rare Leger exhibition catalogue. The total sheet size is 8 1/2 x 6 1/4 inches; the image measures 7 3/4 x 4 1/2 inches (197 x 115mm). Signed by Leger in the stone; not hand-signed. Condition: there is age-toning to the margins, minor creasing and wear around the edges of the sheet. Fernand Leger 1928 pochoir "Le coquillage"
Medium: pochoir (after the gouache). Issued in Paris in 1928 by Teriade for Editions Cahiers d'Art in an edition of 800. This is a rich and magnificent impression printed on Velin de Torpes paper. Image size: 8 x 6 3/8 inches (205 x 165 mm); the full sheet measures 11 x 8 3/4 inches (280 x 222 mm). Not signed. Condition: there is minor soiling to the margins. Fernand Leger 1928 pochoir "Instruments de musique"
Medium: pochoir (after the gouache). Issued in Paris in 1928 by Teriade for Editions Cahiers d'Art in an edition of 800. This is a rich and magnificent impression printed on Velin de Torpes paper. Image size: 8 1/4 x 5 1/4 inches (210 x 135 mm); the full sheet measures 10 3/4 x 8 1/2 inches (275 x 215 mm). Not signed. Fernand Leger 1928 pochoir "La feuille jaune"
Medium: pochoir (after the gouache). Issued in Paris in 1928 by Teriade for Editions Cahiers d'Art in an edition of 800. This is a rich and magnificent impression printed on Velin de Torpes paper. Image size: 8 1/2 x 6 inches (215 x 153 mm). Not signed. At our online art gallery, collectors, art enthusiasts, gallery curators and art hobbyists alike can find authentic and affordable abstract art for sale. Enjoy browsing the bold abstract art online and feel free to contact Affordable Art 101 for any questions.